The bloc has come far, but faces some serious challenges in the years to come. The Association of Southeast Asian Nations (ASEAN) turned 50 this year. Established by just five countries in Southeast Asia, this regional organization has overcome a number of crises through its history, including the communization of Indochina, a civil war in Cambodia, the end of the Cold War and the Asian currency crisis. With membership now having expanded to 10 countries encompassing almost all of Southeast Asia, ASEAN has positioned itself at the center of the regional architecture and succeeded in exerting considerable influence over the peace and prosperity of East Asia. The Association has been seeking Southeast Asian integration, announcing the establishment of the ASEAN Community, the first regional community in Asia, in December 2015. These achievements are all noteworthy. Yet the future is hardly smooth sailing for ASEAN. The South China Sea issue is one major problem. 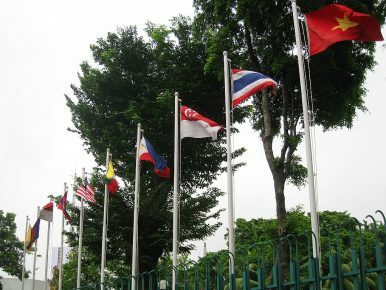 The fact that ASEAN has managed to present a unified position based on a certain line, which has consisted of expression of concerns regarding developments in the disputed waters, requests for a peaceful resolution of territorial disputes, and calls for a code of conduct, putting internal differences aside, tends to escape notice when we overemphasize those elements of the issue where ASEAN members have failed to find a consensus. However, the Association cannot stop China’s land reclamation and construction with the power of the norms it has developed. The exposure of this reality has considerable repercussions, in that it reduces ASEAN’s ability to contribute to peace in Southeast Asia and East Asia. The path of integration in this massive region is a second issue. The outlook for the Trans-Pacific Strategic Economic Partnership Agreement (TPSEP, which evolved into the Trans-Pacific Partnership, or TPP) looks decidedly cloudy now that Donald J. Trump is president in the United States. That may have been a welcome development for certain stakeholders among the TPP signatories within ASEAN, in the sense that they could avoid domestic structural reforms that hold no appeal for them. At this point, only four ASEAN members have signed the TPP, which in some respects contradicts the ASEAN Economic Community (AEC), an ASEAN framework for regional economic integration. From a long-term perspective, however, the establishment of common economic rules in Asia and the Pacific is essential for the stable development of Southeast Asia and the broader Asia-Pacific. The TPP is a framework that had the potential to spearhead this effort. The uncertain outlook for the TPP will likely have long-term negative implications for the economies of ASEAN members. Meanwhile, negotiations for the Regional Comprehensive Economic Partnership (RCEP), a framework aimed at regional economic integration with ASEAN positioned at its center, are struggling. As with the TPP, the future of RCEP negotiations is an uncertain one. The potential of destabilizing political and security factors to adversely affect the progress of integration within the ASEAN region is the third issue confronting the bloc. The ASEAN Charter talks of so-called universal values, such as the development of democracy, the protection of human rights, the establishment of the rule of law, and good governance. These values were regarded as indispensable for stabilizing the political situation in member countries for the long term, and preparing to attract overseas investment, even if democratization and human rights weren’t quite where they needed to be. Unfortunately, the region has been going backwards in democratization and human rights. In Thailand, the military regime is attempting to extend its power. In Cambodia, the long-term government of Hun Sen is working to stay in power by attacking opposition parties and the media. Democratization of Myanmar has far to go. The government there under Aung San Suu Kyi has been widely criticized for its failure to protect the Rohingya people, who have been subjected to rampant human rights violations. In Indonesia, a country where secularism is assumed to have been the governing rule, identity politics linked with Muslim and other religious values is growing, undermining the stability of Indonesian politics and society. Xenophobic nationalism and terrorist attacks by religious extremists (not limited to Islamic extremists) occur frequently within ASEAN, and cast a dark shadow over the stability of the bloc and the entire region. The most critical issue confronting ASEAN is how to balance the traditional ASEAN style of respecting state sovereignty, with aspirations of new ASEAN that proactively advances regional cooperation and integration. The old style powered much of ASEAN’s success, in that it allowed for slow integration while respecting the domestic politics of member countries. Yet the Association must transform itself into a body capable of cooperating on issues that have traditionally been defined as matters of state sovereignty, including reforms to domestic economic structures, if it is going to move forward with integration in real terms for economic growth. Achieving this balance will be an issue ASEAN cannot afford to ignore going forward. Mie Oba is a Professor at the Tokyo University of Science. The bloc maintains a balancing act as Beijing asserts control over disputed islands.